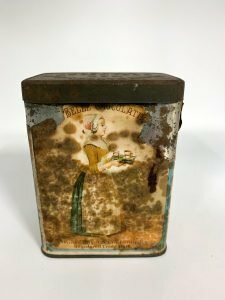 A tin of Baker’s Chocolates from the Maine Maritime Museum collection is an early clue to how chocolate became a symbol of love and beauty. In the 1760s, James Baker opened a small general store in Dorchester, Massachusetts, and financed a local chocolatier, John Hannon. Upon Hannon’s death at sea in 1780, Baker took ownership of the chocolate business, then known as “Baker’s.” James Baker’s new business suffered at the whim of politicians. English trade embargoes in response to the American Revolution made the import of Caribbean cocoa difficult, and at times illegal. James’ grandson, Walter Baker, experienced similar setbacks with the onset of the War of 1812. The business savvy family overcame these sourcing obstacles by diversifying their product. In addition to their primary products “No. 1 Premium” chocolates and “No. 2 Common” chocolates, the company added – you guessed it – “No. 3 Inferior” chocolates. (We will get to improved marketing tactics in a second.) No. 3 Inferior chocolates were mostly sold to slaves on plantations in the American South and Caribbean islands. This inferior chocolate consisted mostly of ground rice. So how did a product with less-than-romantic associations contribute to an industry selling love and beauty? Excellent marketing. Walter Baker initiated a rebranding of the family company that propelled Baker chocolates to a national audience. First, he renamed the company to W. Baker – after himself of course. Long before Willy Wonka inspired millions to find the golden ticket, correspondences indicate that Walter persuaded store owners that his shiny foil wrappers would look “attractive” in their store windows. But it was not until Walter’s step-nephew, Henry L. Pierce, took hold of the company in 1854 that their marketing scheme exploded internationally. The brand was simplified to “Baker’s Chocolate and Cocoa” and adopted a logo known as “La Belle Chocolatiere” (the beautiful chocolate girl). “La Belle,” as she became known, is the image you see on the tin from our museum collection. The young woman stands in profile holding a tray of drinking chocolate. She wears 18th-century clothes – noticeably outdated and reminiscent of a romantic past even in the mid-1800s. Additionally, her demure posture and calm face harkens back to the concept of an “ideal” mannered woman. Who is this woman and how did she find herself on the front of thousands of chocolate tins? Henry Pierce, while on a European holiday, came across a pastel painting by the 18th-century Swiss artist, Jean-Étienne Liotard, in the Dresden Gallery. The painting featured the “La Belle Chocolatiere.” Pierce ordered a copy to be made and hung in the Baker headquarters in Dorchester. In 1877, this replica image was added to Baker advertising and product labels. 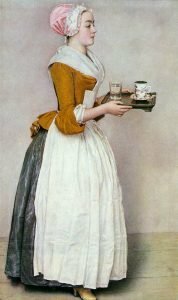 The identity of the woman in Liotard’s original painting remains somewhat of a mystery. But we do know who Henry Peirce and the Baker Chocolate Company promoted her as – a young woman whose beauty won the heart of a prince on first sight. It goes on to talk about the young working girl’s apotheosis into the life of a beautiful princess. A tale, I am sure, resonated well with the middle-class housewives to whom the Baker Chocolates were marketed. The Baker Chocolate tin housed in the museum collection held “Breakfast Chocolate,” a type of powder intended to dissolve easily into warm water. It was first introduced in 1840 and was one of the company’s most popular products until it was discontinued in 1952. Baker’s Chocolate and Cocoa has been incorporated multiple times and now exists under its parent company, Mondelez International. The “La Belle Chocolatiere” lives on. She can still be seen on Baker’s products today. When you open up a bar of Baker’s Chocolate this Valentine’s Day, make sure to keep a look out for the prince (or princess) that is sure to come sweep you off your feet. Want to learn more about the connection between New England and the Caribbean chocolate trade? Join Maine Maritime Museum for a Bixby Chocolate Factory Tour & Tasting, February 15, 2019, 2-4 pm. Participants will get a behind-the-scenes tour, private tasting, and chance to learn more about sustainable trade with the Caribbean.